Cleaning silk ties poses a unique challenge, but it can be done. Contrary to popular belief, you don't have to rely on professionals to rid your neckwear of ink, ketchup or grease stains. In fact, with a little know-how you can restore your silk ties to their original appearance without breaking a sweat. The first thing to remember when cleaning anything made of silk is to stay away from water. Saturating silk with water can aggravate a stain and, more importantly, it can ruin the silk by causing rings or ripples that may compromise the color or pattern. The second consideration is time. Addressing a stain right away is key when it comes to cleaning silk ties. As soon as you notice a stain, blot it with a soft cloth, paper towel, or toilet tissue. Your goal is to remove as much of the offending substance as possible. Remove the tie and lay it on a flat surface. Get a bottle of rubbing alcohol and pour a half cup into a small bowl. Dip a small washcloth or rag in the bowl, then wring it out so it doesn't drip. Dab at the stain with the alcohol until it begins to lift. Scrub gently if needed. Immediately dry the tie with a hairdryer so that the alcohol will not form a ring on the silk. Other cleaning solutions that may work if rubbing alcohol is not available include club soda or a gentle stain remover such as Woolite. Regardless of what type of cleaner you use, it's important to test the solution on the back of the tie first to make sure it doesn't cause the colors to fade or run. Lay the tie on a clean, flat surface. Cover the stain with a thin layer of Borax, cornstarch or talcum powder. Let the tie sit for several hours, so the powder can absorb the stain. Wipe the powder off the tie with a towel. This method may not work on the first try; however, it can be repeated up to three times. If the stain persists you may have to consider recycling your silk neckpiece. Many think that if they get a stain on their silk tie the best solution is to take it to the dry cleaner. However, this option may not be the best alternative. Having a tie dry cleaned repeatedly over a short period of time can result in severe damage. Dry cleaning chemicals can weaken silk and rid it of its shine. In addition, excessive ironing will eliminate those spiffy-looking rolled edges that add to a tie's sophisticated look. Before turning to the professionals to clean your silk neckwear, consider cleaning them on your own using the aforementioned stain removal methods. Tucking the tie into a shirt or jacket or lay it over one shoulder. Spraying the tie with a thin layer of Scotchgard. Using a tie tack to keep the tie pinned to the shirt and out of harm's way. Covering the tie with a bib when the situation allows, such as when eating lobster or crab. Knowing how to rid stains from your favorite neckwear is just the first step in extending the life of your silk ties. Clean ties should be hung on a hanger or placed gently in a drawer large enough that doesn't require bending or folding the silk. If you opt to hang silk ties, be sure they are not squeezed too tightly against other items in the closet. Silk needs room so that air can circulate sufficiently. 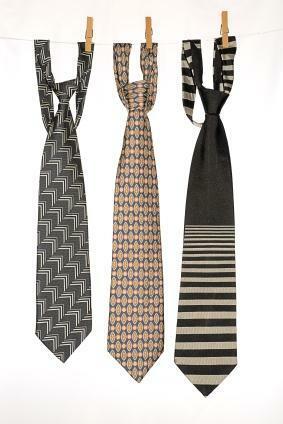 Finally, avoid placing ties in direct sunlight for long periods of time, as they can fade due to overexposure.